Scientists, very well-known in their own fields of expertise, joined researchers from the University of Hertfordshire’s School of Life and Medical Sciences at the launch of their two day research conference. 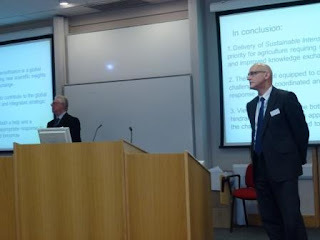 An exciting programme of seminar and posters that reflected the breadth of the research activities across the school was put together and complemented by plenary lectures delivered by the invited guest speakers who came from government and academic institutions across the UK. Professor Quintin McKellar CBE, Vice-Chancellor of the University of Hertfordshire, opened the proceedings of the two day event by launching the University’s new undergraduate degree in agriculture – the BSc (Hons) in Sustainable Agriculture and Food Security which was announced earlier this year. 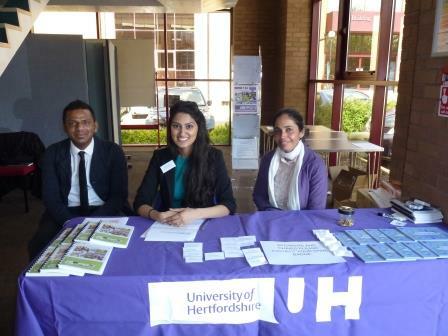 This new degree, aimed at tackling concerns of food security and sustainability, has been designed around internationally recognised expertise and facilities at four partner institutions all located in central Hertfordshire: the University of Hertfordshire, the Royal Veterinary College, University of London (RVC),Rothamsted Research and Oaklands College. Professor Les Iversen CBE, Chairman of the Advisory Council on the Misuse of Drugs, spoke on a topic affecting many young people today – ‘Novel psychoactive substances – the science’. Professor Magdi Yaqoob, Professor and Academic Director of Renal Unit, Barts Health NHS Trust, and William Harvey Research Institute, London UK, talked about ‘Oxygen deprivation preconditioning: journey from bench to bedside’. Dr Timothy Gant, Head of the Toxicology Department at the Centre for Radiation, Chemical and Environmental Hazards, talked on ‘Environmental chemicals and good health: The role of Public Health England in understanding and protecting disease associated with environmental chemicals’. The final closing plenary lecture was given by Professor Ian Campbell, Deputy Vice Chancellor at the University of Hertfordshire, who spoke on the ‘Physiology of athletes with a spinal cord injury’. Postgraduate students from the School of Life and Medical Sciences actively participated across both days of the event by giving talks and presenting posters on their own work. 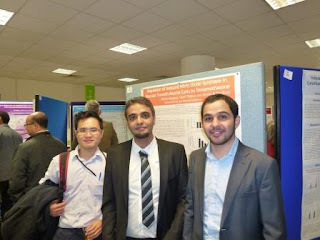 With comments like “well done for hosting an excellent research conference”, “a really great event” and “the conference was a great experience”, it’s clear that students, academics and visitors all found the event very inspiring and enjoyable – so much so that this is planned to become an annual event! Sponsors of this two day research event included: MedPharm, The British Pharmacological Society, Thermo Fisher Scientific, High5 Sports Nutrition, Bounce, AM Sport and the Perry Foundation.